This event is an opportunity for researchers and SSF practitioners from all over Europe to build networks and discuss capacity development to address issues related to SSF in the region. The symposium is open to anyone interested in learning about and linking to SSF in Europe, particularly through markets and stewardship initiatives. 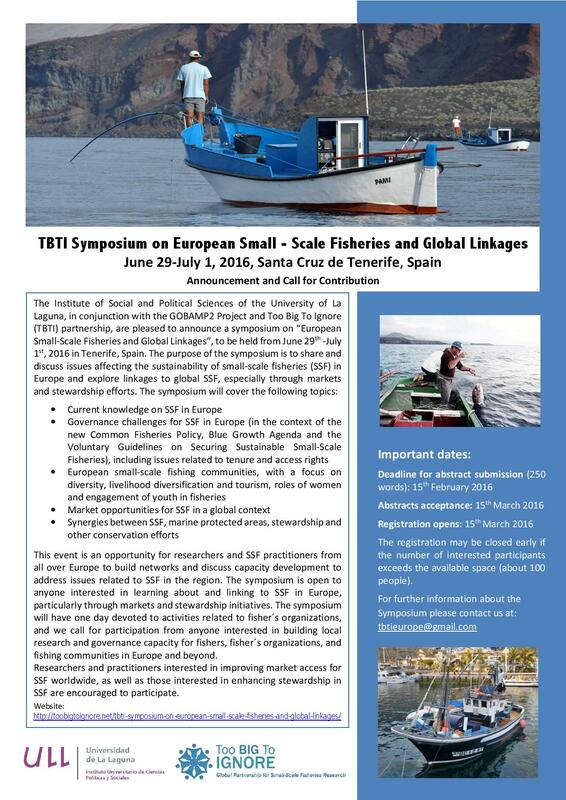 The symposium will have one day devoted to activities related to fisher's organizations, and we call for participation from anyone interested in building local research and governance capacity for fishers, fishers' organizations, and fishing communities in Europe and beyond. Researchers and practitioners interested in improving market access for SSF worldwide, as well as those interested in enhancing stewardship in SSF are encouraged to participate. The registration may be closed early if the number of interested participants exceeds the available space (about 100 people). For any further information about the Symposium please contact us at: tbtieurope@gmail.com. For information about the venue, hotels, airports, download General_Information_English or Información Práctica_Español. What will you be doing on the World Fisheries Day?